At NYCC in October, a beautiful merperson told me about Flame Con, the first-ever queer comic con to be held in New York City. On Saturday I arrived in Brooklyn, unsure of what I’d find. Sometimes, new conventions need time and growth to get their legs. But Flame Con was a total delight. Here’s what I saw. The Hall’s giant main ballroom, ringed by balconies and topped by chandeliers, set the stage for a unique convention the moment you stepped inside and ascended the staircase. Inside, suited attendants directed you to the ticket tables. This was a far cry from the giant, impersonal Javitz Center where NYCC attendees gather in increasing hordes each year. The lavish, fun-to-explore Hall was part of what Flame Con so great. Anyone who has participated in large cons knows that the host space often leaves something to be desired. Flame Con felt comfortable, welcoming and accommodating, from the friendly, abundant staff and volunteers to the affordable food and drinks to multiple spaces to relax. A $6 beer at a table in the sun outside on the veranda, while Spider Gwens and Thors lounged nearby? Yes, please. These perks contributed to the excited atmosphere, but a con is really about its exhibitors and programming. And here, Flame Con knocked it out of the park. The “ballroom” was filled with inspired creators of every kind. There were indie comics-sellers and authors, artists with original, genre and fandom-inspired work, funky jewelry and t-shirts, as well as representatives from cool groups and progressive programs, like the Brooklyn Speculative Fiction Writers and Maven’s Tech Camp, a free LGBTQ summer program for ages 14-21. My only complaint was that it seemed the organizers underestimated the attendees’ hunger for the con panels. They were relegated to an upstairs sideroom called “The Salon,” which was packed to capacity with doubled lines out the door, every time I tried to venture inside. The “Skylight Room,” where performances were held, also filled up quickly. Many were left disappointed that they could not get into the panels, with titles like No More Mister Nice Gay: Uber Violence and Queer Storytelling, A Queer Reading of Sherlock Holmes, Designing X-Women: Making Superhero Costumes, Secret Identities: Transgender Themes in Geek Culture, and The Internet is Ghey. Those I spoke to raved about the panels being awesome — but I wish I could have seen them. Next year, if the con occupies the same space, it might make more sense to hold panels in the airy “gaymer” space, which was less crowded. In addition to the panels, there were events like the “Welcome to Flame Con” dramatic reading by Welcome to Nightvale’s Cecil Baldwin, a performance by musician Sarah Donner, a cosplay pageant, geek meetups, and a four-hour “Fire Ball” party after regular con hours. It was also a markedly safe space, with gender neutral bathrooms and optional “preferred pronoun” tags available when you first came in. Press notes, sent that morning, reminded us that “just because an attendee is dressed as a Scully doesn’t mean he doesn’t identify as a Mulder! 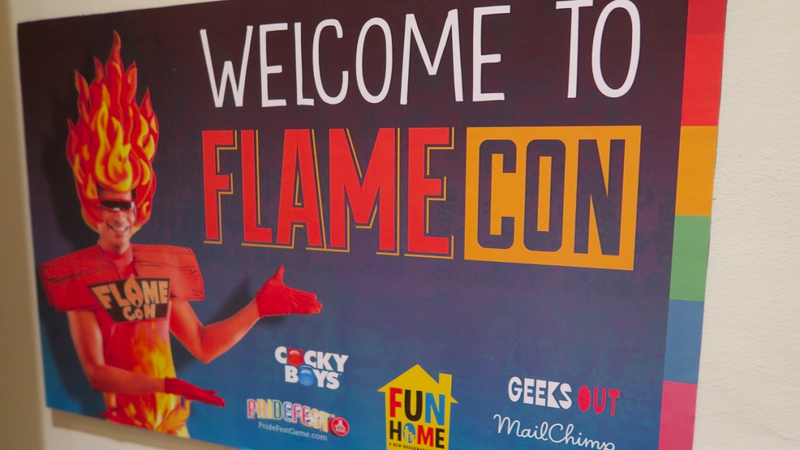 Please be sure to respect attendees’ PGPs (preferred gender pronouns) while conducting interviews,” and pointed out that Flamey, the con’s mascot, was a “they.” All of this was done with respectful tact, and it served to show how up-to-date and thoughtful the con organizers were. It’s difficult to convey exactly how special Flame Con was — but my intended quick visit for round-up purposes turned into a four-hour stay. Everyone I talked to, from cosplayers to booth-dwellers, were thrilled to be there and having a great time; there was a palpable vibe of fun, festive inclusiveness. While many of the artists and exhibitors had queer subject matters, some did not, displaying general genre creations and original art. The message was loud and clear: everyone was welcome here.